WordPress, the Content Management System (CMS) can be installed on a web server in two different ways: One being the easier and simpler way which most of the beginners, noobs or people who don’t want to get their hands dirty use – they use custom scripts like Fantastico, Softaculous, SimpleScript, etc. provided by their web host to install WordPress automatically on their web server; all they need to do is enter some information and KABOOOOM!! It’s all done; a new self-hosted WordPress Blog is live and running. Before we begin, I would like to tell you that installing WordPress manually isn’t that tough; it only requires some technical and practical knowledge. 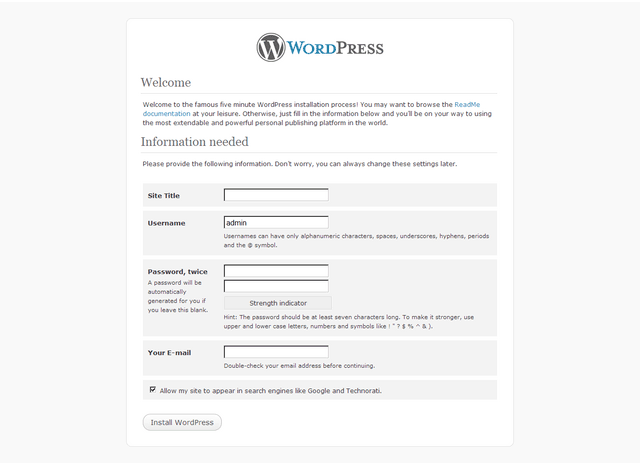 So here we go with the manual WordPress installation. Visit the official WordPress site and download the latest version of WordPress to your PC. You’ll get the software in the form of a compressed file. This is the CMS (Content Management System) your site will run on. 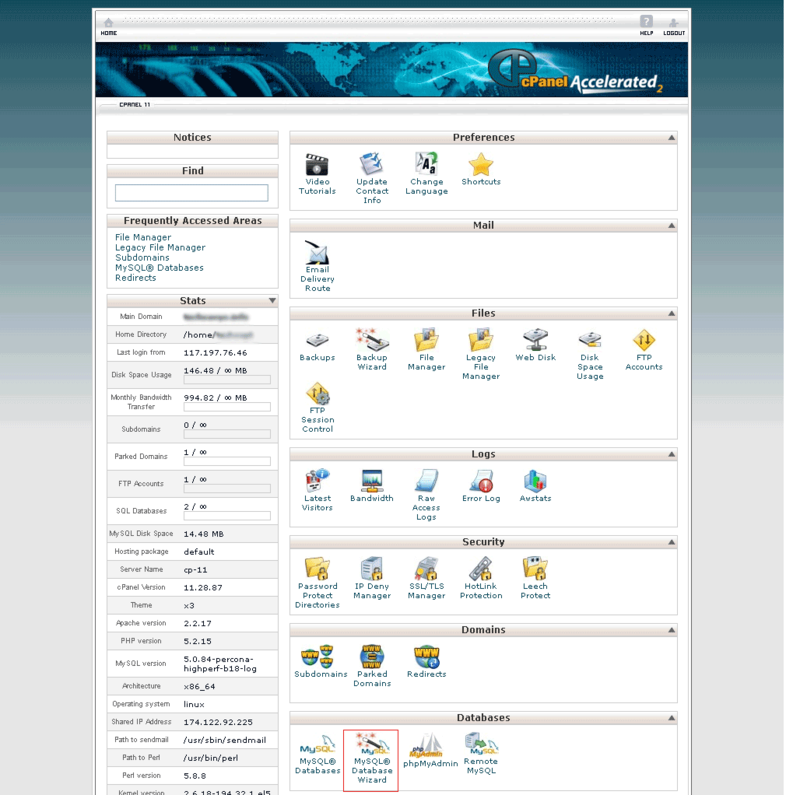 Log in to your cPanel with the cPanel credentials (username and password) provided by your web host. 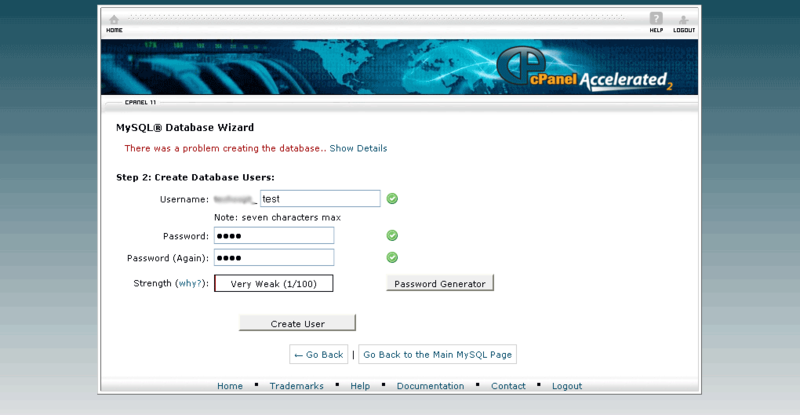 Once logged in, look for the MySql Database Wizard icon, and click on it. You’ll be taken to a page where you would be asked to create a new database. Enter the database name and click on the “Next Step” button. You’ll be asked to enter a new username and password. Once entered, confirm the password and click on the “Create User” button. The next page would ask you to specify the privileges for the user you are about to create. Click on the ‘All Privileges’ radio button in order to give the user full privileges and move on to the “next step”. You’ll see that you have successfully created a new user and a new database. 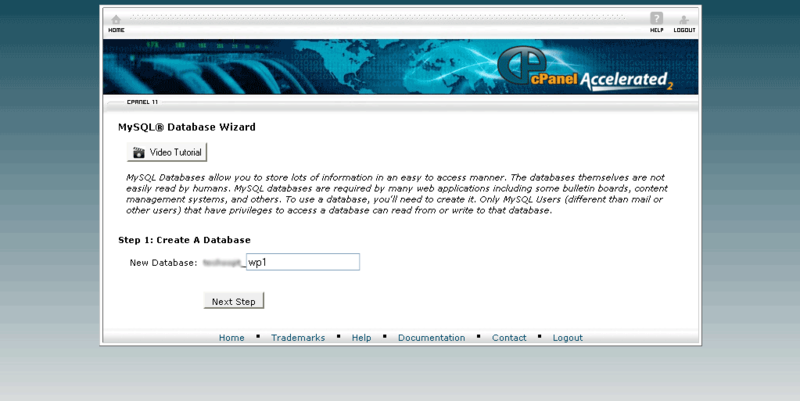 DB_NAME – Enter the database name you just created. 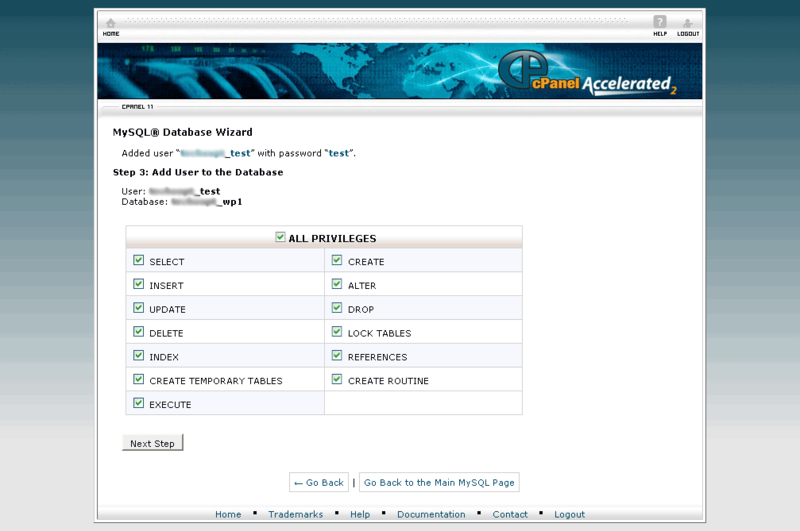 DB_USER – Enter the database username you just created. DB_PASSWORD – Enter the database password you just chose. DB_HOST – The hostname is usually “localhost”. So enter “localhost” here. DB_CHARSET – This is database character set option. Normally you should NOT be editing this. DB_COLLATE – This stands for the database collation which normally should be left blank. Once you are ready with the edited files, you should prepare for uploading all the WordPress files to the server. Open your FTP client (e.g. FileZilla), login using your FTP credentials, and connect to your FTP account on the server (web host). 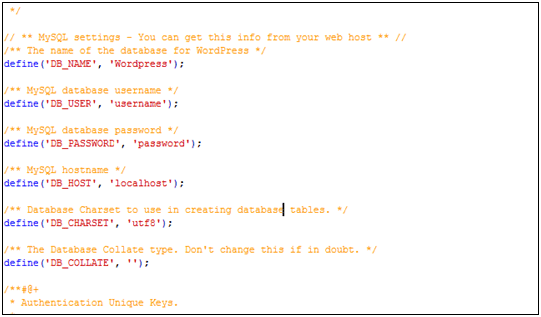 For instance, I would enter wordpres as my username, WordPressAdmin as my password, webdesigning101.com as the hostname, and 21 as the port number. Once connected to the host, you’ll see the folder with / symbol in the right pane. Click on the + sign and you will see a public_html folder. This is the root folder where we will upload the contents of the WordPress folder. Remember! Don’t upload the folder WordPress. Instead upload all the files present inside this folder. (If you upload it along with the WordPress folder, your blog address will be: yourdomain.com/wordpress instead of yourdomain.com). How to upload: Well this is quite simple. The left pane in FileZilla shows the contents of your PC whereas the right pane shows your server’s folders. Browse to the WordPress folder in the left pane, select all its content and copy it over to the public_html folder in the right pane. That’s it, all your WordPress files have now been uploaded to your server. (Replace yourdomain.com with your domain name) and hit enter. You’ll be taken to a page where you will find a button saying “Run The Install”, click on it. On the next page, enter the title of your blog and your email address, check the radio button saying “Allow my blog to appear in search engines like Google and Technorati” (unless and until you want to hide your blog from search engines), and click the “Install WordPress” button. You’ll then be redirected to your WordPress Login page. You can use this page to login to the admin panel of your site using your WordPress username and password. Oh yeah you have successfully installed WordPress. Did this tutorial help you? Share your views and let us know if you found it helpful. WordPress.com vs. WordPress.org: What’s the Difference?